I know people don't like salads in the winter. I am one of those people. But this salad is a hearty salad that will warm you up on even the coldest of days. This is a salad I will often order from Le Pan Quotidien. Yes, Le Pan is a chain, but it is one of the few chains that doesn't actually feel too much like a chain and it's one of the few chains in Manhattan that finds its way out of Midtown and in to other neighborhoods in the city. It is a communal table boulangerie and patisserie with a selection of soups, salads, sandwiches and desserts. And thanks to Mayor Bloomberg and his hatred of fats, trans fats, and salt, which he is trying to ban from every restaurant in the city, I know that this salad contains 420 calories. I decided that I love this salad so much, I wanted to start making it at home. And for the price of one salad at Le Pan, I could make it 5 times at home. For 60 less calories (if my iPhone math serves me correctly). Holla! When making salads, I often like to season every single component of the salad separately. I will add salt and pepper to the greens (something that is often overlooked in the seasoning process but adds huge flavor when done) and then to the white beans. Don't tell Bloomberg. I toss peppery arugula with some homemade pesto with my hands. Yes, they do smell like pesto afterwards, but the best way to mix a salad is by hand to ensure that it is not overdressed. Garlicky hands be damned! Then, I add thin strips of tender and salty prosciutto, slices of sharp parmesan cheese, creamy white beans, and top it with some homemade croutons (the best type of croutons, in my opinion). This is a salad I could eat winter, spring, summer or fall (all you have to do is call and I'll be there, yes IIIII will . You got a friend... doo doo do dooo). Oh, and I apologize for the poor photos. I was having major lighting problems. Daylight savings time can't come fast enough. Preheat the oven to 350F. Tear the bread into large pieces (size or conformity doesn't matter. I can look rustic). Brush with extra-virgin olive oil and place on a baking sheet. Bake in the oven for 10 minutes or until the bread is golden brown. Set aside and let cool. Season greens with salt and pepper. Add pesto and toss to coat. In a separate bowl, season white beans with salt and pepper and add to the salad. Shred the prosciutto into pieces and add prosciutto and parmesan to the salad. Add croutons and serve. For so many years, I feared beets. I only knew beets as those circular red things swimming in liquid at salad bars. You know the ones. With the sneeze guards? To me, those beets looked like the cranberries from a can that you eat on Thanksgiving. And I am not ashamed to admit, I would have those cranberries on Thanksgiving no other way. Cranberries from a can and stuffing from a box. I first tried my hands at beets sometime last year. I stared at the root vegetable, trying to figure out its secret. Questions streamed through my head. Do I leave on the greens? Do I eat the skin? How do I cook these things? So I turned to my trusty friend, Google. I learned that the most foolproof method to cooking beets was to roast them in the oven for 45 minutes or so, let them cool, pull off the greens, then peel off the skin. Oh, and some even suggested wearing gloves, as beets will dye fingers. And so the attack of the red beets began. I forged ahead, sans gloves, and suffered the fate of the red beet. And frankly, after my meal, I still wasn't too crazy about the beet. So now I was unsatisfied, hungry, and sporting a pair of red hands. Fast forward to yesterday, Dupont Circle Farmers Market, Washington, DC. I went with the intention to buy some fruits, but walked out with zucchini blossoms, golden beets, and buffalo meat and... well, no fruits. I decided to try my (un-dyed) hand at beets yet again. I wanted a simple dinner with fresh ingredients, and found a fantastic shallot vinaigrette recipe that looked like it would go perfectly with the golden beets. And it did. The softer flavored golden beet was complimented by a sweet shallot vinaigrette and a crumble of mild and nutty ricotta salata. And the best part? Put oven racks in lower third and middle of oven and preheat oven to 425°F. Trim beet greens, leaving 1 inch of stems attached. Tightly wrap beets together in double layers of foil to make packages (2 or 3 per package) and roast in middle of oven until tender, 40 to 45 minutes. Unwrap beets and cool slightly. Whisk together shallot, vinegar, salt, pepper, and sugar in a small bowl, then add oil in a stream, whisking. When beets are cool enough to handle, slip off and discard skins. Cut beets lengthwise into 1/4-inch-thick slices and gently toss with 3 tablespoons vinaigrette in a bowl. Arrange beets on 6 salad plates and top with ricotta salata. The Best Caesar Salad In the History of the World. I'm not a Caesar Salad kind of girl. I don't like crutons (I know, I know! Who am I???). I hate creamy dressings. I prefer my salad under dressed, and am the typical New York City "dressing on the side" kind of girl. But something in me changed when I saw an episode of Jamie Oliver at Home. In it, Jamie took the crusty old Caesar salad to a whole new level. You won't find any dry old chicken breast, clunky dressing, or crusty crutons in this salad. Oh no. Here, Jaime roasts chicken legs on top of torn up ciabatta bread (which creates the most wonderful, flavorful cruton you will ever taste), a proper caesar salad dressing (with anchovies! Don't be scared! ), lots of rosemary, and some pancetta (I used bacon) to round it all out. What you get is an unbelievably dynamic and rustic Caesar salad. Moist chicken, smoky flavors from the pancetta (bacon), crutons that are both crisp and moist at the same time and packed with flavor, and an deliciously flavorful dressing that amps up the entire experience. You have not lived until you have eaten this salad. Seriously. Everything up until this point has been a dream. You're actually not even reading this post right now. After 45 minutes the chicken should be nicely cooked. Take the pan out of the oven, drape the pancetta or bacon over the chicken and croutons, and put back for another 15 to 20 minutes for everything to crisp up. The chicken legs are ready when you can pinch the meat off the bone easily. When they're cooked, remove the pan from the oven and set it aside for the chicken to cool down slightly. Pound the garlic and anchovy fillets in a pestle and mortar or a Flavor Shaker until you have a pulp. Scrape into a bowl and whisk in the Parmesan, creme fraiche, lemon juice and 3 times as much extra-virgin olive oil as lemon juice. Season dressing, to taste, with salt and pepper. Pull the chicken meat off the leg bones - you can use 2 forks to do this, or your hands if you're tough like me - and tear it up roughly with the croutons and the bacon. Wash, spin dry and separate the lettuce leaves, tear them up and toss with the chicken, croutons, bacon and creamy, cheesy dressing. Scatter with some Parmesan shavings. I love carbs. I eat salads when denying myself my love of carbs, which is often. But bread salad? ZING! It's like my heart pleasing my brain. 1 small cucumber, halved lengthwise and thinly sliced (peel if skin is thick). 1. Toast or broil bread and rub lightly on one side with garlic; reserve garlic. In a bowl, whisk oil, vinegar, salt and pepper. 2. Core tomatoes. Slice top and bottom off each tomato and reserve. Cut tomatoes in half from top to bottom, then cut crosswise in 1/4- inch-thick slices. Scrape all juices into vinaigrette. Take reserved top and bottom slices and coarsely chop. Scrape into a strainer, salt lightly and set over vinaigrette. Press and smash tomatoes in strainer with a spoon and leave to drain. 3. Take a flat-bottomed bowl or dish, at least 3 inches deep and with a capacity of at least 1 1/2 quarts. Rub with reserved garlic, then discard garlic. Line bottom of dish with a layer of bread, cutting to fit dish if needed. Cover with a double layer of tomato slices. Sprinkle with some herbs, shallot and cucumber. 4. Whisk vinaigrette with tomato juices, then drizzle a few tablespoons over salad. Cover with more bread, then press with a spoon to encourage tomatoes to release juices. 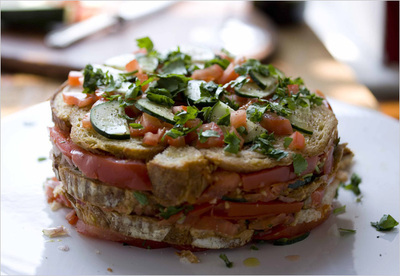 Repeat with remaining ingredients, finishing with a layer of tomatoes and reserving some of each ingredient for garnish. 5. Cover dish with parchment or plastic, then take a plate or flat-bottomed dish that will just fit inside salad. Place on top, press firmly, then add a weight to keep dish compressed (such as a large can of tomatoes). Set aside at room temperature for about an hour. 6. Salad should be oozing and moist. If salad seems dry, drizzle remaining vinaigrette over top. Taste juices; if they seem underseasoned, correct with more oil, vinegar, salt and pepper. 7. To serve, slide a knife around edge of salad, then place a serving dish over top and carefully flip both dishes over to turn salad out onto serving dish. If salad does not release, rap dish firmly on counter. Chop remaining tomato. Garnish salad with tomato, herbs, shallot and cucumber, and serve cut into wedges or in large spoonfuls. Super easy. Super simple. Super delicious. Toss peaches in olive oil, rosemary, and salt. 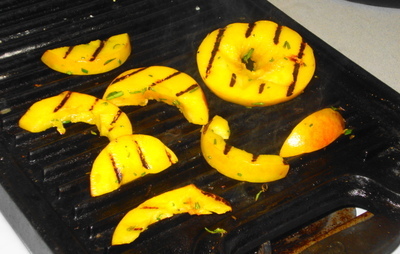 Grill until juices are dripping from peaches and fragrant, about 6 minutes. Meanwhile, mix olive oil, vinagrette, yogurt in a container and shake well. Season to taste with salt and pepper. Mix greens and vinagrette by hand. Do not overdress! You may not need to use all of the dressing, depending on your preference. 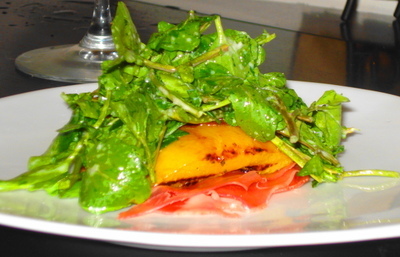 Place prosciutto on plate, top with peaches, then the dressed salad. Top with cheese. Serve immediately. Bring a small pot of water to a boil. Add the sugar snap peas and boil for 1-2 minutes, until just tender. Drain and plunge into an ice bath to stop cooking. In a small bowl, combine the dressing ingredients and blend thoroughly with a whisk. Season to taste with the salt and pepper. 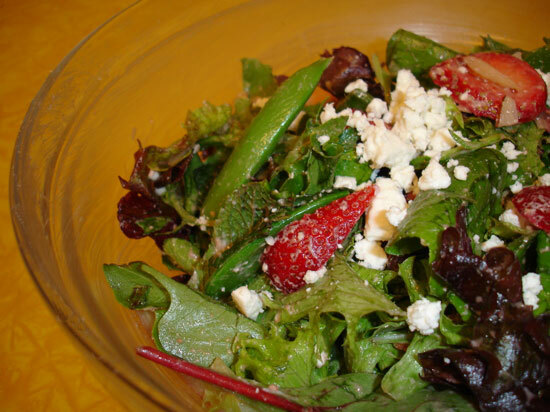 In a large bowl, combine mixed greens, strawberries, feta, snap peas, mint, and toasted almonds. Add dressing, toss to coat, then serve.